The Château de Chambord is the reason people come to Chambord. 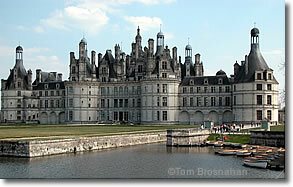 In fact, the château is the reason to go to Chambord. But do be sure to allow time to explore the extensive grounds. If you don't want to visit the château, you can still tour the grounds for free. In addition, in 1952 Chambord was the site of the world's first Sound and Light Show, and it still offers a spectacular show in the summer. There's plenty to occupy a full day at Chambord. If you want to visit other châteaux nearby, consider Blois or Cheverny.